Looking for a pre-installed GUI based Proxy for a while and found Artica recently. The feature is pretty attractive and GUI interface looks cool. 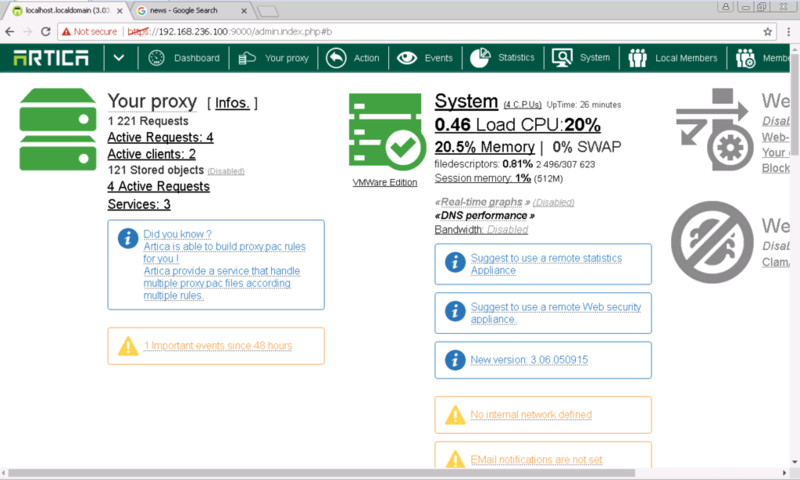 "Artica Proxy is an appliance that claim to manage Squid-cache proxy with all features that Squid Cache provides.With the Artica Web interface you can monitor, manage get statistics of your proxy service. Artica Proxy provides ISOs in order to build a full proxy appliance without any technical skills. Artica Proxy allows to enable Web filtering engine with more than 30.000.000 categorized websites. Other features included such as reverse-proxy, RDP proxy, VPN, DHCP, DNS..."
Here are some my experience on it. There are ISO, ESXi, Hyperv, Xen versions to download. Delete other unused hardware such as printer, usb and sound card. Full installation will take 15- 20 minutes depends on your host performance. Basic configuration wizard will take you 5 minutes to get a full functional Proxy for your internal machines. Current IOS version is 3.03.041314. It can be upgraded to 3.06.050915 by some clicks. 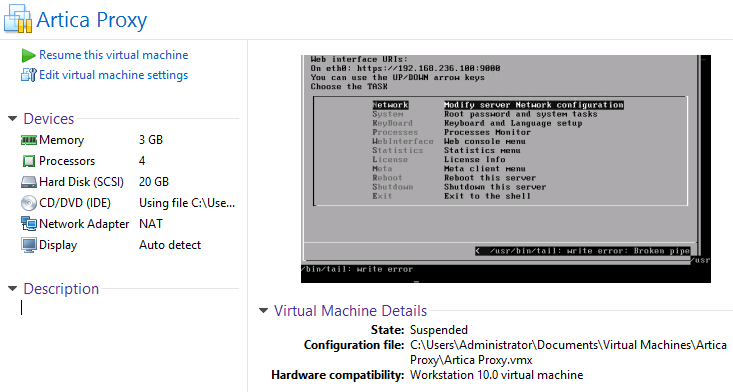 Config client IE proxy with 192.168.236.100 on port 3128. By default, Artica proxy will allow all internal machines to use proxy to surf internet. You wont need to do too much work to get all your clients to use this new proxy. Artica Support is amazing. I have been tried to open tickets in their tracker system, in next a couple of hours they posted videos to answer my dummy questions. Artica also has a forum to let users discuss there.